We didnt really have any plan today. After mailing out my BBM package, we brought the kids to a warehouse toy sale at Lok Yang where my sil is working. The kids got to choose the stuff they want to get. Tihani had chosen a princess set and Auni a barbie doll set. 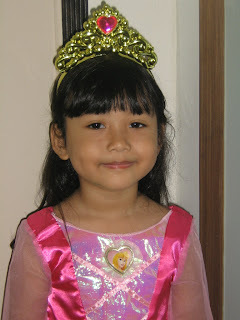 Tihani got home and tried on her princess outfit .. presenting Princess Tihani .. I got myself some arty farty stuff to do with the kids too .. hehehe .. well there's still the kid in me!